← How do you pay for a ride on SF Muni with a $20 and a $1? Bing, Yahoo! 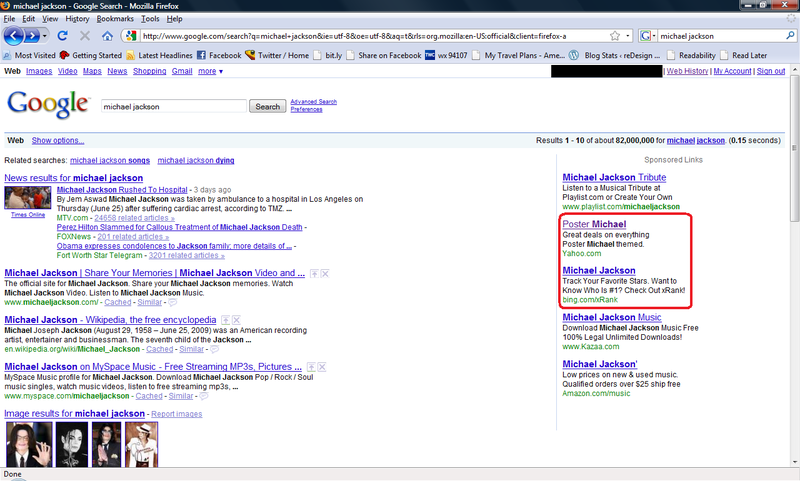 ads on Michael Jackson results on Google. Click to see full version. Seen over the weekend: ads for bing and Yahoo! on Google search results for “Michael Jackson”. The bing ad led to bing’s xRank page for Michael Jackson. The Yahoo! ad bizarrely led to a Yahoo! shopping results page for Michael posters, most of which had nothing to do with Jackson. The bing ad appeared every time I reloaded the page. The other ads were much less frequent. Update: AOL has joined the fray with ads for AOL Music, including a pitch to download a “Michael Jackson tribute toolbar” on the landing page. This entry was posted in advertising, aol, bing, google, search, yahoo. Bookmark the permalink. Micheal and other parties should not be offended by that, its just business you see.